Prosecco in the Park: The Office? 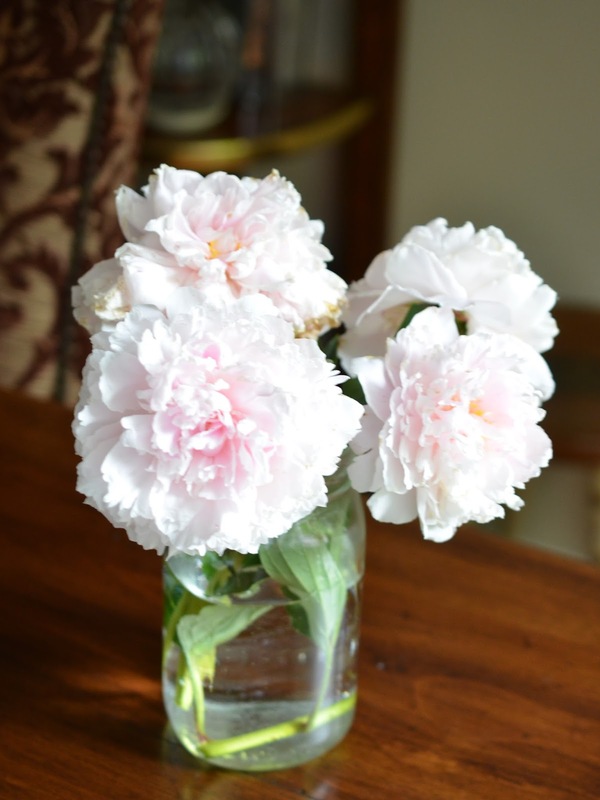 Fresh peonies from JD's garden. Mine did not bloom this year. I have a feeling it has something to do with the plant being drowned in saltwater last October. This week was super productive for me. I watched the first three seasons of The Office on Netflix and nervously waited to see if I would come down with a stomach bug after JD caught one earlier this week. I did not, luckily. I didn't meant to watch the first three seasons of The Office, it sort of just happened. I got sucked in and then kept watching and waiting to get to the episodes I remembered liking, mostly involving the Pam & Jim story. They played some pretty good pranks. My favorite so far is one that they didn't even show. Jim gradually filled the receiver of Dwight's phone with nickels so he would get used to the weight and then one day took them all out, resulting in Dwight hitting himself in the head with his phone. Amazing. That one kind of makes me wish I could go back in time. My best office prank was probably mirror imaging my friend Mike's desk. He never changed it back. I'm pretty sure that everything is still in the exact same place on that desk to this day and he doesn't even work there anymore. And on that note, it's Friday! Yay. Have a great weekend!